不想在VS平台和HF平台因使用MH而封号或降级的玩家可以使用由[一起玩哟]开发的 VSMapHack 防封号防降级的全图作弊工具, 还有强大的DOTA自动躲技能 等功能, 即可畅通无阻的使用全图或改名与不败等作弊工具, 不再受封号和降级的困扰. 注意: 如果你在平台上无法开启, 则请尝试关闭"360保险箱"或"金山"或在"微点"把本软设入信任程序 (若网吧装了冰点还原则需要关掉), 如果是Vista或者Win7用户, 请点鼠标右键单击 W3MapHack 图标以"管理员权限"运行 W3MapHack. PS: 在浩方上随意使用，不过会有降级风险。在VS上使用为防止封号, 关闭显示隐形并只开小地图, 或者使用拥有强大功能的 VSMapHack 平台防封号防降级作弊工具. Hi guys, I am JiaJia. Here she brings us a new tool. This tool helps you to edit the key of Numpad and other keys. 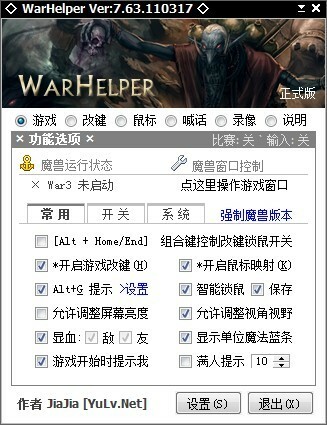 This version WarKey++ based on the increase of the function to modify the mouse wheel. * Mapping the mouse wheel, ideal for Improving the micro level in DOTA. This version also adds more options to change key switch freely. This program supports the latest War3 1.26patch. Perfect running in Win7/VISTA system, just like running in XP. You don't need to select "Run as administrator".